The impressive Bishop’s Palace chamber in Cheddar. During the 60’s with the abandonment of National Service there was an increase of caving activity by the post war population bulge. Readily available commercial Scuba equipment was adapted to cave diving. 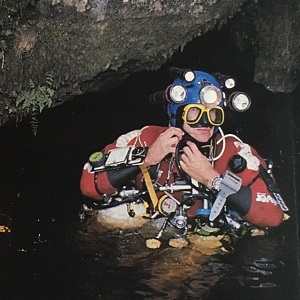 The process was accelerated by the publication of “Cave Diving on Air” by Mike Boon and the formation of the Independent Cave Diving Group. The large-scale approach to diving began to slim down as a direct result of tackling the constricted Sump Six in Swildon’s Hole and Sump Two in Stoke Lane Slocker. 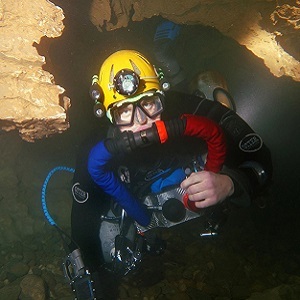 Diving was also coming into its own in every caving region as cavers found more sumps. Changes in the availability and pricing of diving equipment occurred as the commercial markets expanded. A new and freer phase in our social history helped. Cave divers slimmed down their gear and immediately met with success in passing tight sumps. In underwater squeezes the question of walking or swimming simply did not arise. Divers became virtually self-supporting and capable of pushing farther ahead. Steve Wynne-Roberts and Fred Davies, made ingenious modifications were made to the smallest oxygen rebreathers available; whilst Mike Boon opted to use air and tiny “tadpole” cylinders. On 7th July 1961, Mike succeeded in passing Sump Six in Swildons, the first of many successes using air sets. The following year, on 9th June, he forced his way through the very tight Sump Seven by removing his kit and feeding it ahead by hand. It was a daring (some would say utterly mad) technique that had been carefully rehearsed in a swimming pool. During this period there were few thoughts about pushing the 21m-deep sump in Wookey Hole whilst short and shallow ones were “going” elsewhere on most weekends. It was a great shock and setback when E. J. Waddon died whilst practising with a newly modified Oxygen re-breather in the Priddy Minerys pool on Saturday 3rd November 1962. Jack had encouraged and helped train the younger divers of the day and, in their eyes, he embodied the traditions of the CDG. Naval experts blamed the equipment at the inquest but, yet again, other factors seemed just as likely to those who used the very same set before and after the incident. Once more, uncertainty clouded CDG affairs. There were critical moments when its regional framework might have collapsed but for a strengthening of the constitution, training procedures and tests under Michael Thompson’s leadership and Dan Hasell’s commonsense presidency. Cave divers in the regions rallied to the overhauled CDG. Whilst all this was going on, three students from Bristol University set about training themselves during the autumn of 1964 and by Christmas formed the self-styled Independent Cave Diving Group. Mike Wooding, Dave Savage and Dave Drew adopted Mike Boon’s approach: they bought a couple of Scubair regulators and cylinders and got on with it. Cylinders were slung from waist belts, weights were kept to a minimum, only wetsuits were worn, a single NiFe lamp on an ordinary helmet sufficed and they carried fins for swimming the longer sumps. It was a logical reduction of the old view that ordinary cavers with the bare minimum of diving equipment could get results. Solo caving and diving was the ultimate development of course. By the 20th March 1965, the ICDG trio had pushed the Swildon’s streamway to Sump Twelve. The final choke beyond Sump Seven in Stoke Lane Slocker was reached on the 22nd May and passed to 100 feet of passage on the 30th October. Neither has been passed since – a remarkable legacy and vindication of their work. Later in March they joined the Cave Diving Group. Dr Oliver C Lloyd (OCL) also submitted himself for tests with them. He was 54 years of age and became the oldest active cave diver to qualify. OCL had taken on the task of running the CDG the previous Easter after Alan Clegg drowned because of tangled lines in the Master Cave Sump of Lancaster Hole. The next twenty years of the CDG until the mid-1980s were dominated by OCL in many ways. He ran Friday night training sessions for the Somerset Section and all-comers in the Students’ Union swimming baths at Bristol University. The Severn Bridge and M4 to South Wales ensured close links with the Welsh Section. He organised and held most of the equipment at his home in Westbury-On-Trym. Editing the CDG Newsletter and other publications was one of his great pleasures for it kept him in touch with everyone, and in control. His distinctive editorials and comments were very influential far afield, and he was a good correspondent for active divers around the world. 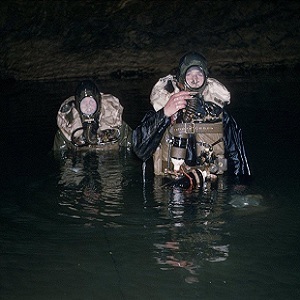 The modern phase of cave diving bears his stamp, a phase which has seen rapid advances in equipment and techniques with record long and deep dives in every caving region of Britain and in other countries. The pages that follow contain much that is traced back to OCL. Oliver Lloyd died after going to Priddy on Mendip on the weekend of 18th-19th May 1985 to show the film that he made in Swildon’s Hole in 1960 about sump rescue for the Mendip Rescue Organisation. So, sadly he missed the fiftieth anniversary celebrations of cave diving and reunion of cave divers who represented the full 50 years, held in the Third Chamber of Wookey Hole Caves on 4th October. Divers began to dive deeper and further, inevitably, there were yet more tragedies. In 1970, Alan Erith was killed in Keld Head and the following year, Paul Esser was killed in Porth Y Ogof. Alan’s body was recovered in 1975 and Paul’s in 2010, 29 years after he perished. A series of innovations were introduced in the interest of safety: Separate cylinders, each one with an independent demand valve, the adoption of the “Thirds Rule”. One third “IN” one third “OUT” with one third kept as a safety reserve and the first comprehensive review of line laying practices was published by the CDG in 1981 in “Line Laying and Following” by Geoff Yeadon. The CDG’s cave diving procedures continue to be developed and the CDG Manual has been adopted by both the Swedish and Brazilian caving federations as their training manual. CDG members used these techniques to good effect. In 1972 John Parker and Jeff Phillips pass Agen Allwedd Turkey sump 5 to discover 600 metres of new passage and making 450 metres of progress into the downstream sumps. In 1978, Jochen Hassenmeyer’s penetration of 1006 metres into Keld Head set a new European record for a dive in a single sump and difficulty with a low squeeze led to the well known ‘Dead Man’s Handshake’ incident. In 1979 January Geoff Yeadon and Oliver Statham make the through dive between Keld Head and Kingsdale Master Cave. In 1983, Midge Hole was linked to Hurtle Pot by Rupert Skorupka and Johnny Shaw and upstream Hurtle was explored by Geoff Yeadon to 35m depth and 500m penetration.